It's rare that the shorts make an appearance during an Irish summer but this week has been a real corker and I wore them for three days straight. I got these shorts from the Avenue 57 pre-loved page on Facebook a few weeks back....for a bargain price of about £8. They're from TU at Sainsburys and are called 'Boyfriend' shorts which means they're nice and loose...just the way I like my shorts as I'm not a huge fan of getting the legs out. 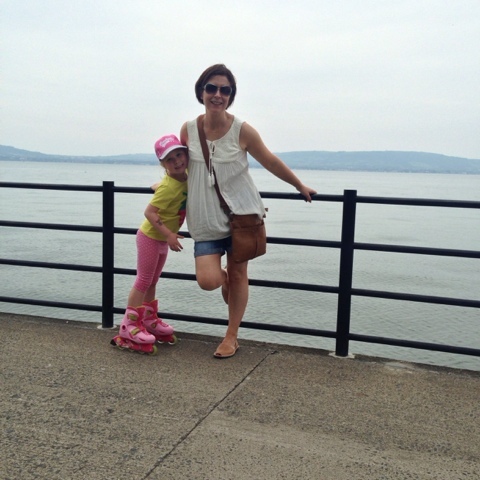 Here I am on Wednesday on a walk along the coastal path at Holywood, the girls on their rollerblades and me running/walking behind them. We were just in time to see a few of the Tall Ships coming into Belfast Lough ahead of the festival which started the next day. I love the Tesco top so much, I actually bought another one today. Has anyone else ever done that? I had tried the yellow colour way but the colour didn't like me so I went to change it and just decided to get the cream one again. My justification is that cream tops discolour over time and I've good form in ruining them in the wash....but the girl at the customer service desk was amused by the fact that I was wearing the same top that I was buying. On Thursday, I had to return something to M&S which reminded me that I had a voucher from my birthday that was unspent. That's old age for you! 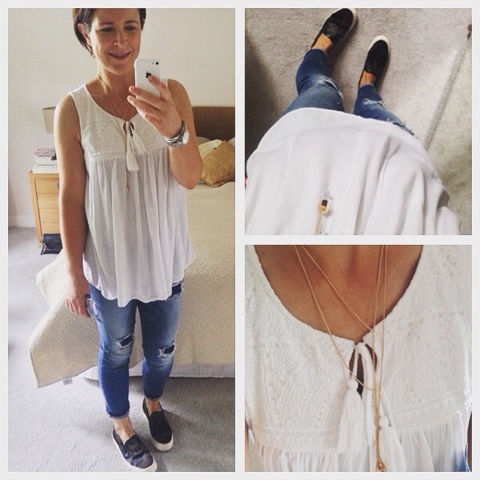 This is what I wore..
Necklace - new stock for the shop...available soon! I opted for the coral on the 6 year old's recommendation. She's good at these things. 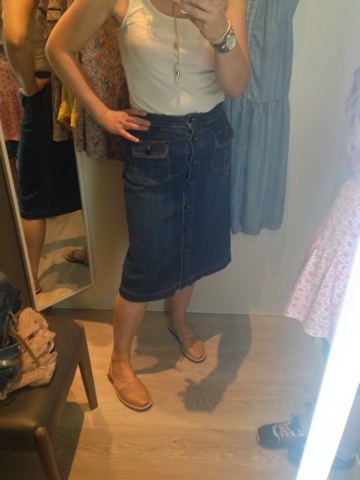 I also tried on this denim midi skirt but it was too tight in the 10...no 12's in stock sadly or I would have picked it up too. It's not online for me to link to but it's from the Limited Edition range if you're in-store. Thought it was high time I washed the shorts after all that so today I'm back in the Tesco top with some distressed jeans I bought pre-loved from Anneli's Tictail shop for a trip down into Belfast for the Tall Ships. About to put my feet up after all the walking this morning and a busy afternoon cooking and cleaning...I hope you're doing the same. Enjoy the rest of your weekend! Fabulous outfits Avril. 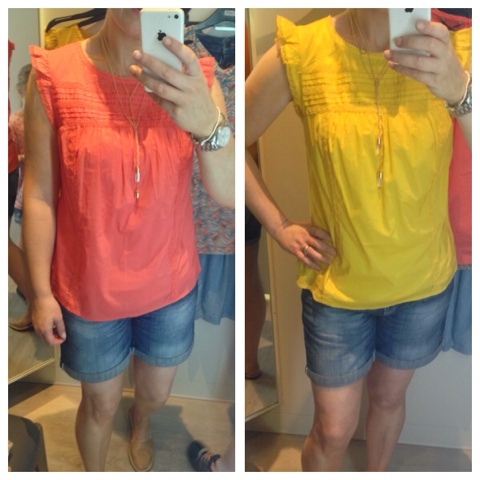 I love the yellow and coral one from M&S. That Tesco top is great - I still haven't managed to go suss out their stock. Only a few Tescos sell clothing in Dublin. And you're not alone ... I also bought two of the same cream tops in Zara a few months ago. When you find a good one, it's always a good idea to stock up! 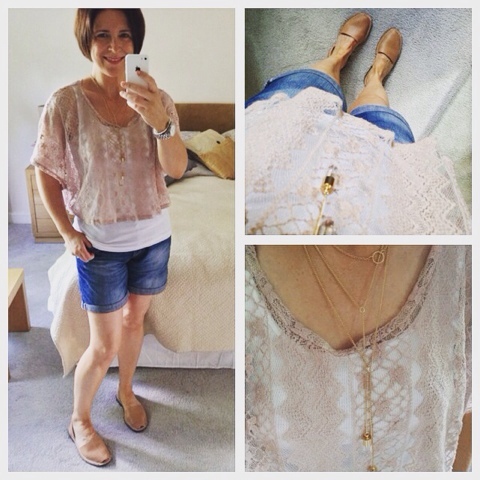 I went to Tesco & bought this top on Friday after your recommendation then wore it on Saturday & it is lovely, really comfy & washes well. I tried on the mustard one too but did nothing for my skin. 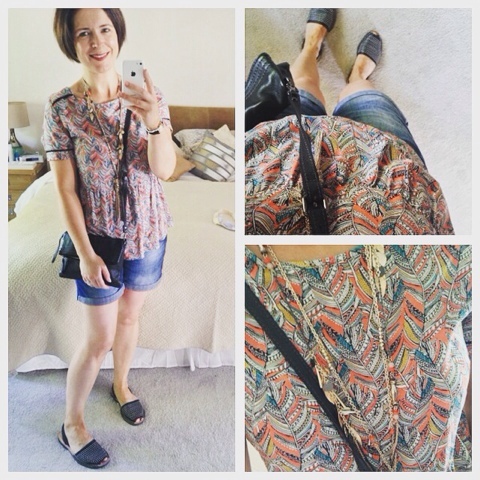 Loving the M&S peplum top - may need to take a trip there tomorrow! !